I hit the streets with the Catalina Cruz Campaign yesterday. Catalina is running for the 39th New York Assembly seat, to represent the extremely diverse neighborhoods of Jackson Heights, Corona, and Elmhurst in Queens, NYC. 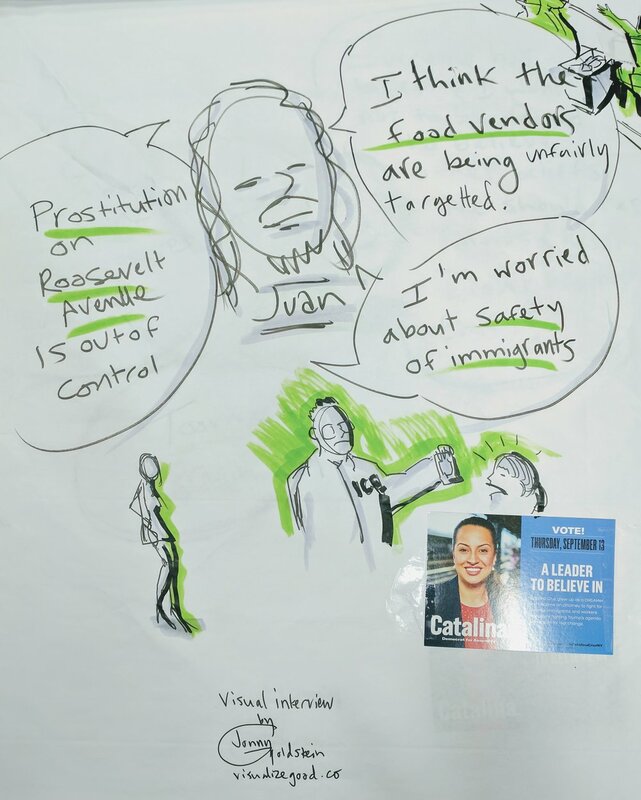 To see what issues are on Voters' minds, we did visual voter interviews on the sidewalk on 37th Avenue in Jackson Heights, Queens. I love this interactive form of visualization where I interview people and then reflect what they say into pictures and words. We learned a lot about peoples' concerns. Pedestrian safety was a big one. Catalina Cruz (left) joined me with some of her volunteers. The voter in Green, Dona Teresa, had a lot of issues she was passionate about. I was proud of this one because it was entirely in Spanish, and I was able to do it! Thanks to Barbara Van Scoyk and Maria Daniels, my excellent high school and college Spanish teachers! Some issues were wider ones, like treatment of immigrants, and some were hyperlocal, like prostitution under the elevated train in our neighborhood. All in all, it was a very successful event, in addition to learning about voters' priorities, we generated a lot of attention from passers-by, we created powerful collateral that can be used in electronic communications, we projected an innovative and caring image (which in my experience reflect reality as regards the candidate) and we had a great time.